Nithin, Raashi Khanna starrer Srinivasa Kalyanam has recently wrapped up its censor formalities and has been awarded with clean U certificate. Satish Vegesna, who directed Shatamanam Bhavathi has taken care once again with all the elements to attract youth and family audience. 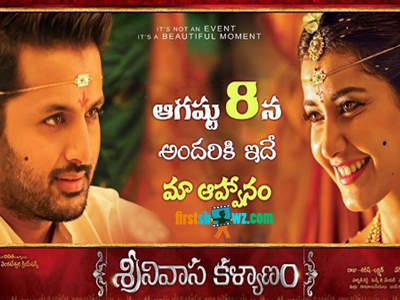 Recently Srinivasa Kalyanam theatrical trailer has been unveiled by Superstar Mahesh Babu. Dil Raju is producing this film under Sri Venkateswara Creations Banner while Mickey J Mayer has score tunes. The film also has Nandita Swetha, Prakash Raj, Jayasudha,Praveen, Vidyu Raman, Sithara in key roles. This romantic entertainer is slated for Aug 8th Release worldwide.